These arms are shipped with 3 degrees of positive caster dialed into the adjustable heim bearings. More caster is achievable by threading in or out the heim bearings. Track width can also be adjusted. For our pivot we use a chromoly, heat treated heim bearing. Metal to metal support on the ball to body can handle heavy shock & vibration loads and has a increased cross-sectional thickness for greater tensile strength. This bearing is the big brother version we've used for many, many years of trouble free service in our Adjustable Strut Rods. Surprisingly this bearing doesn't increase harshness like you would think, instead, it improves the ride quality by transmitting any road irregularities into the shock and spring for those components to soak up the bumps. This type of bearing not only offers bind free operation, but as an added bonus the threaded section can be used for adjustment to change the length of both control arms. By adjusting the length of both control arms for alignment and minimizing the stack of shims used to compensate for chassis variances, a more rigid connection to the shock tower is achieved. When combined with a set of our Tubular Lower Control Arms and a Lower Control Arm Camber Kit we were able to achieve over -5 degrees camber with the bearing threaded all the way in and the arm bolted straight to the shock tower on our 66 Mustang test car. We then left the UCA bolted to the tower and used the Lower Control Arm Camber Kit to pull the LCA in so we could get our track alignment camber setting of -2.75 degrees. Combined with our Adjustable Strut Rods we set in +5 degrees of caster. As well as improving camber gain, a shorter UCA also increases tire clearance. By using the UCA as short as possible and a Lower Control Arm Camber Kit to set camber a 245/45/17 tire can be installed up front on our 66 (with a rolled fender lip). Every car is different however so your results may vary! To gain even more caster and tire to front fender clearance, the front heim bearing can be un-threaded further than the rear bearing. This dials in positive caster so the strut rod doesn't have to be as short giving more tire clearance to the front valance if using a large tire. We sell them. Don't want one? No problem, thread out the heim joint bearing to make each UCA longer, then use a minimal amount of shims to set alignment. Just make sure both arms are of equal length! The limitation of this however is you can only make the upper arm as short as it will go. After this you run out of negative camber adjustment. Use the Lower Control Arm Camber Kit for more adjustment. What if I want a street alignment - something around -0.5 degrees camber? Easy. Just thread out the heim bearing an equal amount on each control arm and use shims or the Lower Control Arm Camber Kit to get the camber setting you want. Don't want to take the arms off the car? No problem, just use shims or the Lower Control Arm Camber Kit. Complete, detailed instructions, performance and track alignment settings included with the control arms. Why not use a barrel adjuster to change the arms length? We didn't want to use a barrel adjuster to change the arms length because having arms at different lengths would mean the pivot points wouldn't be equal side to side. This would result in different camber curves left and right. The same issue should be mentioned for setting alignment with barrel adjusters. By adjusting the length of the arms to get the correct alignment, inevitably you'll end up with different length arms and thus a different camber curve on each side of the vehicle. This is only beneficial for your alignment guy, not your cars handling. For anybody that wants a second opinion on keeping both arms equal lengths, read Bob Bolles' 'Stock Car Setup Secrets' - ISBN 1557884013. By not using a barrel adjuster we were able to use the space they would occupy for a cross brace tube. The images below represent our attention to detail and a competitors lack of it. On the left is a FEA simulation we ran on our control arms. It highlights peak loads in the tubes just short of the ball joint plate. 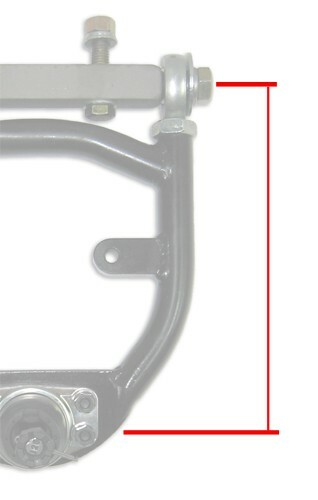 By adding the rear cross brace near the heim bearings we were able to significantly increase the strength of our arms. The analysis proved that we achieved a 3:1 safety factor, even when using inflated inputs of a 4000lb car braking over 1G and cornering at 1.3G. The image on the right shows a competitors bent arm. 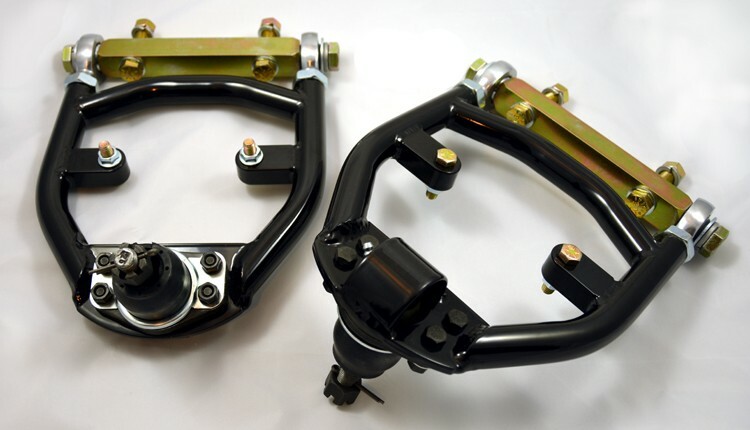 We built these control arms with performance and handling in mind. If that means it takes longer to set the alignment because both UCA's need to be the same length then so be it. Your lap times or freeway on/off ramp outings will benefit. We've developed a rigid, stiff, rebuildable set of control arms that fix the stock control arm positive camber characteristics. Combined with the large range of possible camber/caster settings these control arms offer something for the weekend street cruiser to the drag or road race Mustang owner. Shipped with the front bearing 3 turns further out than the rear. This adds approx. +3 degrees of positive caster to the spindle when installed before having to shim the front bolt or shorten the strut rod. More or less is easily possible by simply adjusting the bearings in or out. 4140 Chromoly cross shafts - no weak aluminum drop shafts for us! Shaun, You helped me through getting new shocks and upper control arms for my 67 mustang. I had a peculiar car because I needed more negative camber after my shock towers had been welded. Everything went in well besides some grinding needed on the spring perches (rollers from opentracker) and they look great. My alignment is now good (before your UCA's I had 1 degree positive, the car now has 1/2 negative). Yesterday I took the car to willow springs, more specifically the streets of willow, for a track day event. The car was astonishing! Not a new car, but it sure did keep up with them (I even passed some Evo's). The car was linear, easy to control in a slide and a downright pleasure to drive on the track! The front had excellent grip, and was very predictable. Its not the easiest car to drive but an utter pleasure. I am very satisfied with the shocks and UCA's. Great products, keep up the good work! I would just like to mention here that doing business with you has been an absolute pleasure. Not only does your products outshine all the opposition but so does your service. You’re a champion bloke. Just wanted to let you know that my '69 drives far better than ever! Your control arms are the best, well worth the wait. No more bump-steer, no odd behavior in corners, it corners like its on rails. What really amazes me is how smooth the ride is now. I expected some harshness, but its actually smoother than before! Very high quality stuff. I am super impressed. Cannot wait to get my car running to test it out. I appreciate your help.